If you have never heard about a Ductless Heating & Cooling System then you will want to hear this. 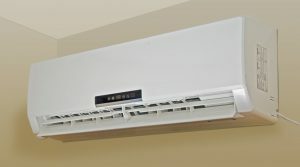 Because this system does not require air ducts a Fujitsu/Mini Split System can be installed into any home. Regardless if you do not have a attic or a basement a Mini Split System can be installed to handle all your Heating & Cooling needs. DeZiel Heating & A/C is your trusted West Metro, Wright County, and Buffalo Heating & Cooling contractor that provides Fujitsu/Mini Split Repair & Installation services. If you are interested in taking your comfort to the next level then give our West Metro, Wright County, and Buffalo Heating & Cooling Contractors a call. Like a conventional forced air system a Mini Split System keeps the noisy stuff outside. Instead of having a big, bulky, centrally located, indoor air handler it has smaller air handlers that can be installed into each room, giving you Individual Zoning Comfort options. Individual Zoning Comfort means you only heat or cool the areas of your house that are occupied. Instead of having a air duct system a Mini Split System only requires small copper piping to let its air handlers disperse the cold or heated air throughout the room. With a Fujitsu/Mini Split Heating & Cooling System you can cut down on your energy costs and stay comfortable in every room of the house. Energy Efficient – A Fujitsu/Mini Split System offers a increase in cooling efficient with 40% less cost of installation compared to forced air systems. Individual Zoning – With a Mini Split System you can cool or heat the areas you want without having to waste energy on the rest of the house. Quiet Operation – We have all heard a forced air system turn on. A Mini Split System keeps the compressors and motors outside so there is less noise inside. No Ducts – A ductless system helps keeps your installation cost low and best of all it can be installed into any house or room. Regardless of a basement or attic space. Year Round, Whole Home/Business Comfort – Your new Mini Split System can produce both heating and cooling for your home. Keeping your energy cost low and your home comfortable all year long. If your Fujitsu/Mini Split System is not preforming like it should then call DeZiel Heating & A/C. Our West Metro, Wright County, and Buffalo Heating & Cooling Contractors can handle all your Mini Split System Repairs. At DeZiel Heating & A/C, our certified technicians use state-of-the-art technology to diagnose and repair Mini Split System to get your family comfortable all year round. That is why our technicians have fully stocked vans, so we have on hand anything we might need to fix your problem. If you are looking for Fujitsu/Mini Split Repair & Installation Services then please call 763-684-3965 or complete our online request form.